The feeling of first love is bliss. It is the best thing that can happen to anyone. One can never forget his / her first love. First love makes you go weak in the knees. First love is something which everyone always yearns for. First love makes you love life over and over again. Oh my god! It all sounds so mushy and sweet. Is it really so? Let’s check it out. Note: Before I go on, in this post I am referring to love BEFORE marriage. Not a person falling in love after marriage leading to an extra-marital affair :D.
Question: What is first love? My Answer: The first time you really fall in love with someone. Question: What is second love? My Answer: The second time you really fall in love with someone. Note: I know we can fall in love with a person more than once. But that’s not my point here :D.
It’s as simple as that. 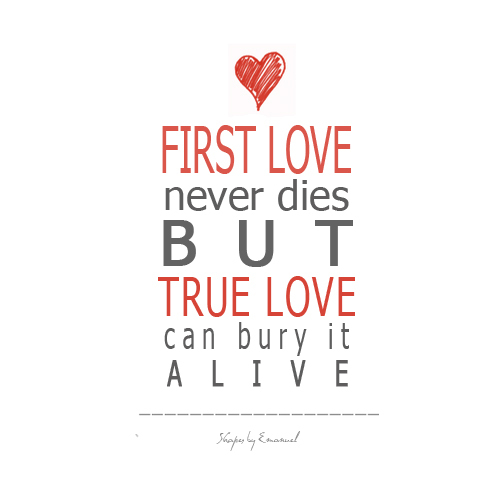 I have always wondered as to why is first love regarded as the be-all and end-all as far as love is concerned. Do we mean to say that a person cannot fall in love more than once? Do we mean to say falling in love a second time is a crime? Or are we ashamed that since we weren’t able to make it work the first time, we shouldn’t try a second time because society wouldn’t agree? So what really is special about first love? First love maybe special for a variety of reasons. In one case, a person who has been searching for the special someone for years maybe delighted to finally find that person. While in other case, an individual may just stumble upon love when he’s least expecting to. The feeling of being in love makes him live each day to the fullest. Happiness, Delight , Joy – one feels all this and more when he / she falls in love for the first time. But then when the bubble bursts, disaster strikes. Suicides, depression, loneliness, aversion to anything related to love, one goes through some or all of these emotions. It seems as though the world has suddenly come crashing down all around us. And then we make promises to never fall in love all over again. And when life does tell us to look forward and be happy, we turn our faces away. All we can do is start giving lectures on first love, how first love is the last love of a person, how he / she looked, spoke, ate, talked and all the stuff related to our past. And then it all starts looking like a movie story where a person goes into depression and thinks of committing suicide rather than falling in love again. C’mon guys, what is this hype about first love? Is there really a big deal if a person falls in love all over again? If someone has dumped another person, does it mean he / she shouldn’t move on? Maybe that first love wasn’t really love after all. As someone said, the show must always go on. When God takes away something from us, he ensures that we would get something good someday. That day maybe tomorrow, day after, after few months, whatever. But that day would surely come. And the same goes for love. If we lose someone, it doesn’t mean we cannot find someone better. First love is bliss. Agreed. But that doesn’t mean one can’t fall in and out of love more than once, does it? Haha do I really come across as making a point to myself? 😛 Yeah thought of finally exploring the ‘interesting side’ of love and relationships. Am sure it gives a lot of food for thought to one and all :). Love. as much you can. As much as you want. forever. but all we learn from one another and influences around is to sulk ! Oh yeah there are so many of us who just love to crib about each and everything. I have always felt that its so much easier to be happy and keep ones life simple than sit and crib and cry and make everyone’s life hell. Maybe once in love, sanity goes for a toss ;). Hahah is it really the dark side? 😛 Why so? Ahaa, comparisons! That’s the biggest problem every human being has. To compare one with the next and then the next and go on. If one is an apple and another is an orange, how can we really compare? Similarly every person is different. I guess that’s what one needs to understand.